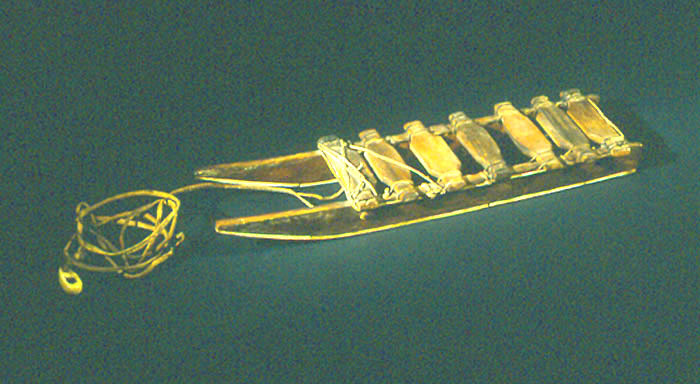 Model of a wooden sled. It is ladder-shaped and was made by attaching cross-slats to two parallel boards. The runners were reinforced with bone. A hide rope with an oval-shaped bone toggle has been tied to the sled. The toggle was used to keep the hide dog harnesses from curling up. Learn more about carioles or sleds - enter 'sled' or 'cariole' in the search box to your left. Check the Beaver Index - e.g., My First Experience of Camp Fire and Cariole, by Augusta M. Harding, March 1925. This model was made for trade or sale to a European Canadian and was purchased as a souvenir item. It is based on a traditional type of short flat sled (komatik) that was used for hunting. Wood for the frames was obtained from driftwood, from available stands of timber near the tree line, and in some cases, from the trading posts. The runners were usually shod with bone or antler to reinforce the runners. Some groups froze peat to the underside of the runners to reduce friction. Before loading the sled, the cross-slats were covered with skins to prevent anything from falling through. The loads were also covered with skins and secured with hide thongs to the sides of the runners. The sled was used as a means of transportation for at least three quarters of the year. The sled was pulled by a dog team, and in areas of heavy snowfall or on difficult terrain, the hunter assisted the dogs by helping them to pull the sled. Some Inuit also had longer travelling sleds that were used for hauling caribou hide tents, household goods and people.